Isaac N. Greathouse, born November 18, 1792, died October 21, 1832. Greathouse Family Cemetery, Hancock County, Kentucky. The Greathouse family cemetery is located on Hwy 1957, also known as Lee Henderson Road, close to where it T’s with Hwy 1605. It is very close to the Henderson family cemetery, and both are marked with a road sign – although the cemeteries are easily visible from the road. Isaac Newman Greathouse was born in Nelson County, Kentucky, November 18, 1792. He was the son of Harmon Greathouse and Marcia Buche (she was also called ‘Mercy’ and her last name has been written as Bukey). 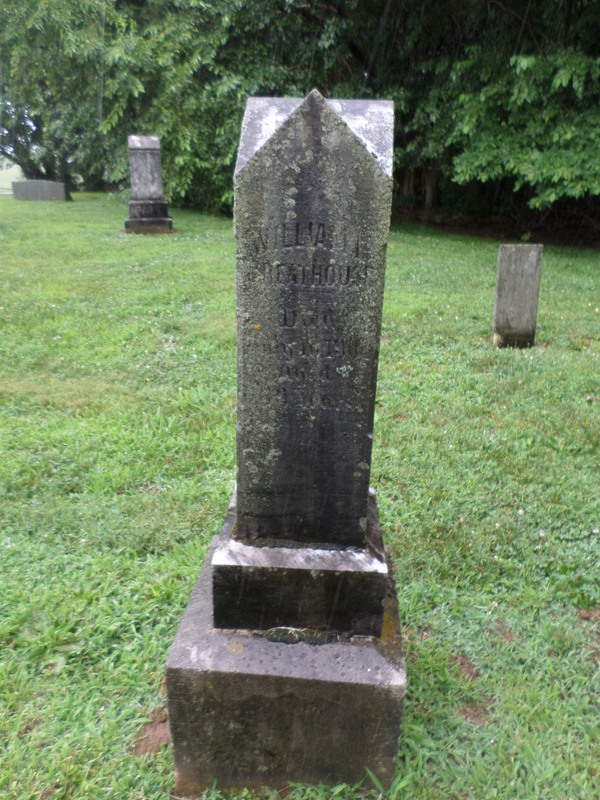 Harmon and Mercy moved from Frederick County, Maryland, to Nelson County, Kentucky. 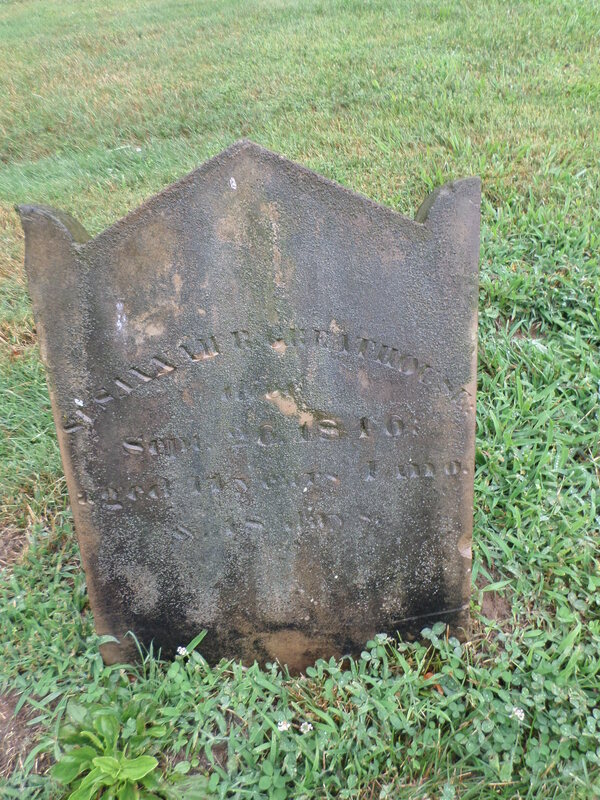 Elizabeth B., wife of Isaac N. Greathouse, born July 14, 1799, died April 4, 1879. Isaac Newman Greathouse married Elizabeth Berkeley Lewis in 1818. Elizabeth was the daughter of John Lewis and his cousin, Hannah Lewis. Hannah’s parents were William Joseph Lewis and Catherine Jennings Linton (a sister to my Captain John Linton). Original stone for Isaac Greathouse. To the memory of Dr. I. N. Greathouse who departed this life October 21, 1832, aged 40 years. Hannah Amanda Linton Greathouse was a daughter of Isaac and Elizabeth. She lived only fifteen years. 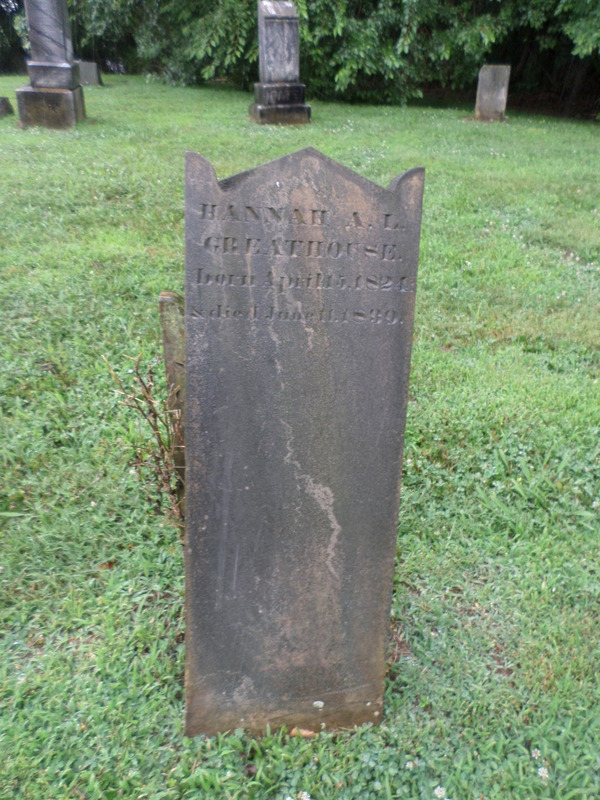 Hannah A. L. Greathouse, born April 15, 1821, died June 11, 1839. William Linton Greathouse was a son of Isaac and Elizabeth. He was born in 1832, either just before or after his father died. William L. Greathouse, died July 16, 1901, aged 69 years. Rodolphus B. Greathouse was a brother to Isaac Newman Greathouse. He was born in 1801, probably in Nelson County, Kentucky. 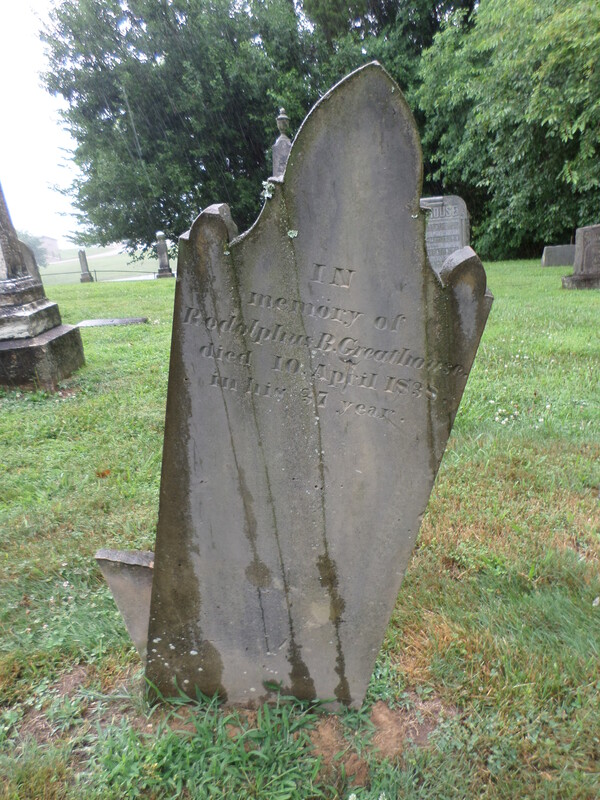 In memory of Rodolphus B. Greathouse died 10 April 1838 in his 37th year. 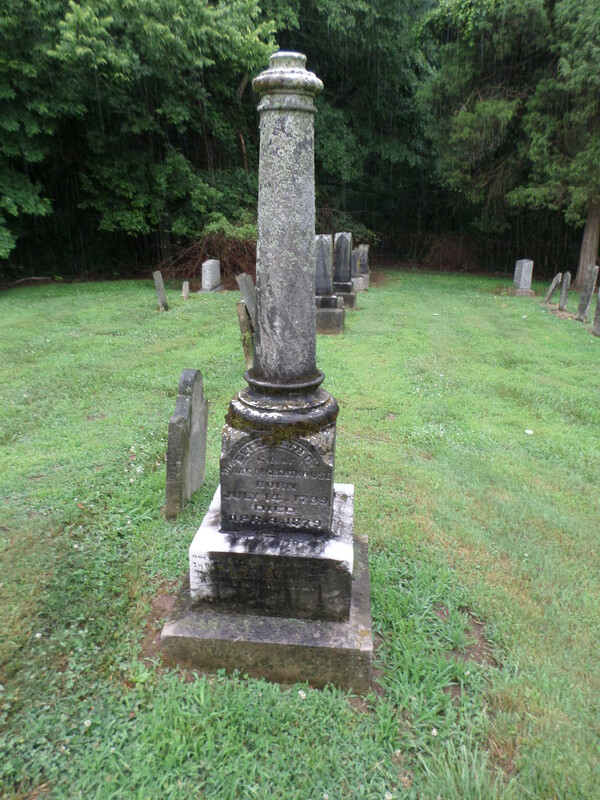 Susannah E. Greathouse was the daughter of Isaac and Elizabeth Greathouse. 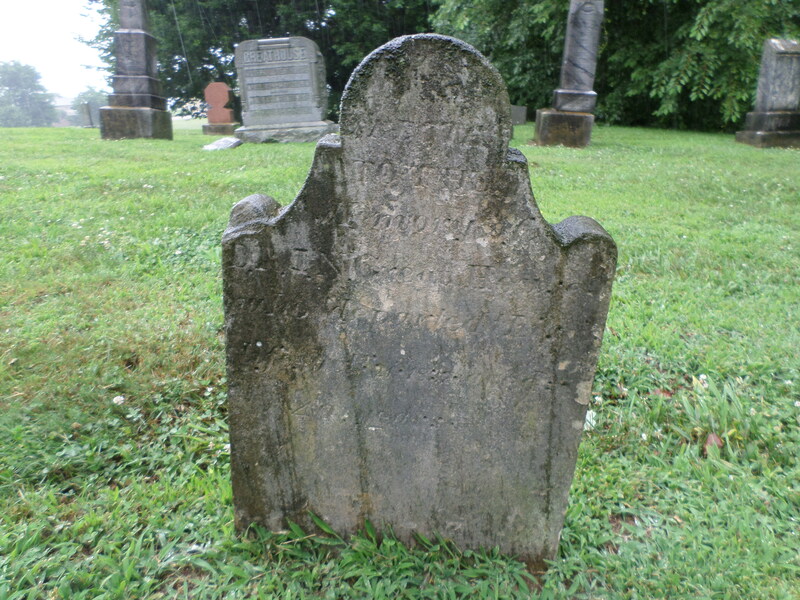 Susannah E. Greathouse, died September 26, 1846, aged 21 years, 1 month and 18 days. 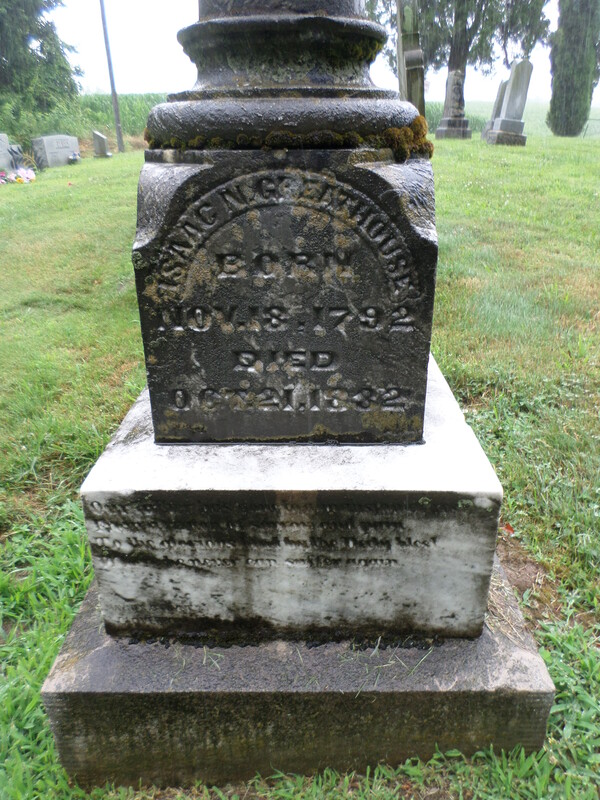 Isaac and Elizabeth Greathouse had four other children for whom we do not have gravestone photos. Son John L. Greathouse was born in 1819, and died two years later. Harmon Bukey Greathouse was born in 1822 and died 1889. Joseph Linton Greathouse was born 1828 and died 1891. John Fletcher Greathouse was born in 1830; in the Hancock County death records he is listed as dying November 11, 1852, in Rolls County, Missouri, of typhoid fever. I do not know if they brought his body back to Kentucky for burial. These photos were taken in the rain – we will return one day for sunshine and blue skies and retake! July 1st – Happy Wedding Day!!!! !